First, I'd like to say "Thank You" to the creator of this plug-in, as it is one I am currently using. 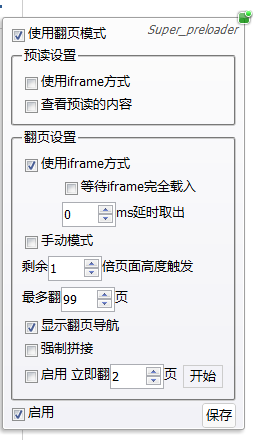 Also, whilst an online language translation tool isn't perfect, it can be a little bit helpful for those of us who can't read Chinese... - PLUG-IN DESCRIPTION " Use this plug-in to pre-read page, full speed up your browsing experience, a variety of pre-read mode, the built-in flip common rules and uniform rules on the website, and powerful. Description feedback address http://goo.gl/HMwPn "